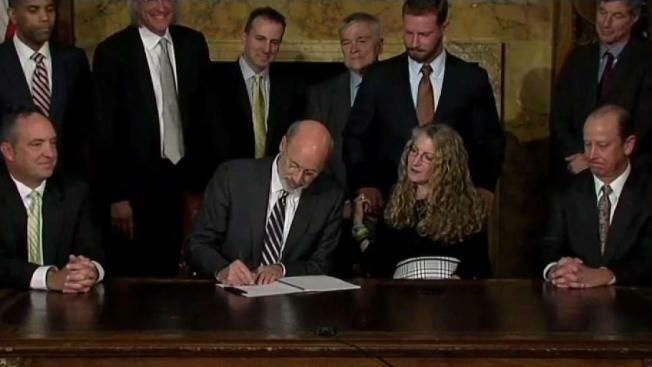 Pennsylvania Governor Tom Wolf passed the Timothy Piazza Anti-Hazing law. The law will increase penalties for hazing, and has come after the death of Penn State student Timothy Piazza. A string of guilty pleas has left just five defendants still fighting charges in the hazing-related death of a pledge at a Penn State fraternity two years ago, a case whittled down as prosecutors were unable to get the most serious counts to stick. Twenty-eight members of the now-shuttered Beta Theta Pi house at one point faced charges after Tim Piazza, a 19-year-old engineering student from Lebanon, New Jersey, consumed a large amount of alcohol and fell several times on a night in February 2017 when the fraternity accepted new members. Piazza suffered severe head and abdominal injuries, but help was not summoned until the next morning. He later died at a hospital. All of the most serious criminal charges, which for several had included involuntary manslaughter and felony aggravated assault, are gone. Prosecutors had difficulty getting them approved by judges during four marathon preliminary hearings. By now, 14 have pleaded guilty to comparatively minor charges, mostly alcohol- or hazing-related, and a 15th has a plea hearing on the court schedule for next week. Those sentenced so far have generally received probation and community service. Six others have entered a state program designed for first-time, nonviolent offenders that will likely leave them without criminal records. And two former defendants no longer face any charges. Piazza's parents view what happened as "a case of collective, reckless conduct" and recognize that the dismissal or withdrawal of some charges is not unusual in criminal cases, said their attorney, Tom Kline. "The issue is whether there has been a full measure of justice," Kline said. "And that judgment will certainly be reserved until the entire criminal process plays out with all of the defendants." Piazza's parents expect to sue in the coming weeks, and the defendants who have admitted criminal culpability can expect they will also be civil defendants, he said. The five young men still facing the possibility of trial are the fraternity's president and its pledge master at the time, a fraternity house manager accused of deleting footage from the house's elaborate video security system, and two other members. Vice President and pledge master Daniel Casey and President Brendan Young had been expected to go on trial in April on charges that include reckless endangerment, hazing and alcohol violations. But state prosecutors are now appealing a judge's order that evidence taken from their cellphones may not be used. Braxton Becker's evidence tampering case involving the security footage is in the preliminary stages. The other two had been scheduled for trial with others who have taken plea deals, and the future of those cases is unclear. Defense attorneys have vigorously argued that the most serious charges should never have been brought in the first place and that filing hundreds and hundreds of counts was unwarranted. Some have suggested politics played a role in the former prosecutor's decision to bring them. Then-Centre County District Attorney Stacy Parks Miller announced the charges on the eve of the 2017 Democratic primary in which voters ousted her as the county's top prosecutor. "The bottom line is, her popularity was in the dumper; she was facing a primary battle," said John Sughrue, attorney for Bo Han Song. "And she tried to use this case as a headline-grabber to help her political campaign." His client awaits sentencing for giving alcohol to minors but originally faced charges including involuntary manslaughter and felony aggravated assault, and the possibility of a lengthy jail sentence. After Parks Miller left office a year ago, her successor turned the case over to the state attorney general's office, which also had difficulty getting more serious charges approved. Judges threw out some of the involuntary manslaughter and assault charges, and prosecutors withdrew the others. In an email to The Associated Press, Parks Miller criticized the actions of the state attorney general's office. She said the fraternity brothers are basically getting "slaps on the wrist." "It cannot be both that the uncovered facts were so heinous they resulted in a swift rewrite of Pennsylvania law, and at the same time, so 'minor' people should have received a first-time offenders program," she said. Investigators concluded Piazza had at least 18 drinks over 90 minutes. The security system recorded much of what happened before and after he fell down a set of basement steps, had to be carried back upstairs, and spent the evening and ensuing night on a first-floor couch, exhibiting obvious signs of severe pain. His death prompted Penn State to ban the fraternity, and state lawmakers last year passed a toughened anti-hazing law that permits confiscation of fraternity houses when severe hazing occurs. Prosecutors and defense lawyers, citing a judge's gag order, have offered little comment about how the case has evolved in the past year. Penn State said its student conduct office investigated 36 students at Beta Theta Pi, and those found to have violated the code of conduct received discipline that ranged from probation to expulsion. Even with the most serious counts tossed, "they come away from this with some form of a criminal record," said St. Vincent College law professor Bruce Antkowiak, a former federal prosecutor not involved in the fraternity case. "It's not like this is an insignificant thing."